Despite significant falls in both strike numbers and reported casualties, civilians still remained at risk in the three conflict-affected nations presently monitored by Airwars. In total, as many as 5,947 non combatants were locally alleged killed by international military actions across Syria, Iraq and Libya during 2018. In Libya reported airstrikes were down by a third during the year, while in Iraq both strikes and reported civilian harm fell precipitously. However Syria remained a lethal environment for non combatants. Alongside major territorial advances by the Assad government and its Russian and Iranian allies, there were significant military offences by the US-led alliance and its Kurdish proxies; and by Turkey. IDF officials also declared that more than 2,000 munitions had been fired by Israeli aircraft within Syria during the year, primarily against Iranian and Hezbollah military targets. Local monitor the Syrian Network for Human Rights estimated that overall, almost 7,000 civilians were killed by all parties to the fighting during the year. With the US-led Coalition’s conventional war against ISIS likely ending in early 2019, Airwars will continue to monitor actions by all international forces in both Iraq and Syria – while also seeking to ensure accountability for affected civilians. By the end of 2018, so-called Islamic State (ISIS) had reportedly lost 99% of the territory it had held back in 2014 – and the US-led war against the terror group as a territorial entity was expected shortly to reach a conclusion. By late 2017, the government of Iraq had already announced victory over ISIS. Declared Coalition strikes in Iraq continued to decline heavily throughout 2018, falling by 92% on the previous year. Airwars monitored only three reported casualty events from Coalition actions in the country during 2018. Two of these were self-reported by the Coalition itself, suggesting that local public reporting remains a challenge in Iraq. The US-led war shifted almost entirely to scraps of ISIS-held territory in eastern Syria, where civilians remained at significant risk. The fight to completely eradicate ISIS became increasingly ferocious as the year wore on, with 50% of all likely civilian deaths for the year tracked during the last quarter, as strike numbers in Syria also rose steeply. By November 2018, Airwars was tracking the highest reported civilian harm from Coalition actions since the capture of Raqqa in October 2017. Strikes increased by 48% in December, though likely deaths fell by 59% on the previous month. This fall could indicate civilians had managed to escape from areas under assault, though might also suggest – as we have seen in previous battles – that local reporting had broken down during end-stage fighting. This may mean that the death toll might be higher than the figures tracked by Airwars. Even so, overall 2018 saw a sharp year on year fall in reported civilian harm. According to Airwars tallies, non-combatant deaths from Coalition air and artillery strikes decreased by 80 per cent across Iraq and Syria compared to 2017, falling to between 821 and 1,712 civilians estimated killed during the year. However, a multi-year assessment by Airwars suggests that a far greater likelihood for the steep rise in civilian harm seen in 2017 was due to the phase of the war itself. The Mosul and Raqqa assaults were always predicted to be the most intense, and the most dangerous for civilians, because of the numbers of non combatants still trapped under ISIS occupation at the time and the ferocity of those battles. A comparison of Airwars civilian harm tallies across the years bears this out. The minimum figure of 821 civilians likely killed in 2018 is similar to tallies seen during both 2015 and 2016, under President Barack Obama. Airwars estimates that at least 712 civilians likely died in Iraq and Syria during 2015 for example. The following year, we tracked a minimum of 989 likely civilian deaths across both countries from January to October 17th 2016, when the East Mosul assault began. With Mosul and Raqqa liberated from ISIS’s grip, 2018 saw the war move back towards the kind of lower intensity conflict seen in 2015 and 2016. There were, however, alarming peaks in civilian harm linked to particular assaults, such as the battles for Hajin and al Soussa. What we may be seeing, therefore, is less the differences between two presidential approaches, and more the variations between different cycles of a war. Even so, the ferocity of the Coalition-led assaults in the last quarter of 2018 on Al-Soussa and Hajin (see below) during which 50% of 2018’s likely deaths occurred, suggest that the US-led alliance applied few of the lessons learned during the brutal urban battles of Mosul and Raqqa, when it came to the protection of civilians. As in 2017, the alliance repeatedly and often aggressively downplayed the impact of its actions on the most vulnerable people on the ground in Syria – despite mounting, credible evidence to the contrary. Despite the Syrian government of Bashar al-Assad announcing in November 2017, that it had defeated ISIS, the terror group clung on to ever-decreasing scraps of territory in eastern Syria throughout 2018. Advances by the Kurdish dominated SDF into these areas were met by fierce resistance, and as the year wore on and the US-led alliance ramped up its efforts to liberate key ISIS-held towns in Deir Ezzor governorate – where 86% of the year’s Coalition casualty events were tracked – civilians on the ground paid an increasingly high cost. To date, the Coalition has conceded 11 events across Iraq and Syria in which it confirms having killed or injured civilians during 2018 – down from 157 such confirmed events for 2017. An additional 117 civilian casualty incidents were classed by Airwars researchers as ‘Fair’ for 2018 – an 82% fall on the 674 fair events during the previous year. An event is assessed as fair when it has two or more uncontested credible sources, and where the Coalition has confirmed it carried out strikes in the area. Overall, Airwars itself estimates that between 821 and 1,712 non-combatants were likely killed in these 128 events in both Syria and Iraq in 2018 – an 80% decrease on the 4,205 to 6,472 civilians estimated as likely killed by Coalition strikes in 2017. At least 421 additional civilians were reportedly wounded in these 128 events, an 84% fall from the year before which saw at least 2,686 civilians wounded. This sharp fall in likely deaths and injuries coincided with a large decrease in Coalition actions. From January 1st to December 29th 2018, the Coalition reported 3,593 air and artillery strikes against ISIS across Iraq and Syria – a 69% fall on the 11,573 actions it reported in 2017. Of these strikes, 252 (7%) were in Iraq and 3,341 (93%) were in Syria. Civilian deaths in Syria tied to incidents rated as “Fair”, or Confirmed by the Coalition, fell by 81% to 126 events in 2018. Between 807 and 1,698 civilians were likely killed across such events compared to between 2,989 and 4,613 likely deaths during 2017. This represents a 73% drop in the minimum number of civilians likely killed by the US-led alliance in Syria. Of these 807 civilians, at least 214 were reportedly children and 185 were women. 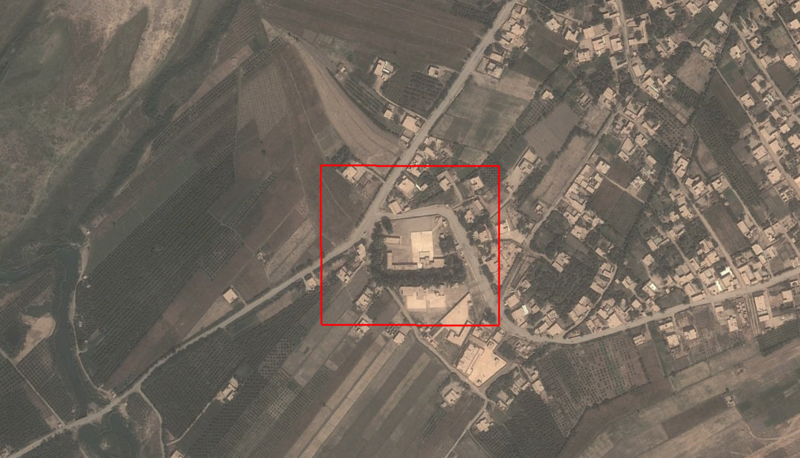 A stills grab from an al Amaq [ISIS media agency] propaganda video detailing reported destruction at al Bahra following an alleged Coalition strike on February 4th 2018. Likely deaths fell sharply in March and reached a near all-time low in April. However, in May they spiked once more as the US-led Coalition announced the resumption of SDF ground operations against remnant ISIS forces in northeast Syria, now dubbed Operation Roundup. Ground operations as part of phase three of Operation Roundup commenced on September 11th, leading to a tripling in Coalition strike numbers in Syria. Surprisingly, this did not result in an associated rise in likely fatalities. Indeed, in September Airwars monitored the lowest number of likely civilian deaths in the four year war – possibly because many of the towns in Deir Ezzor had been largely emptied of civilians who were now taking refuge in camps in the countryside, according to some sources. However, the last quarter of 2018 saw a significant climb in civilian harm allegations, with 50% of all likely deaths in the year occurring within the final three months. 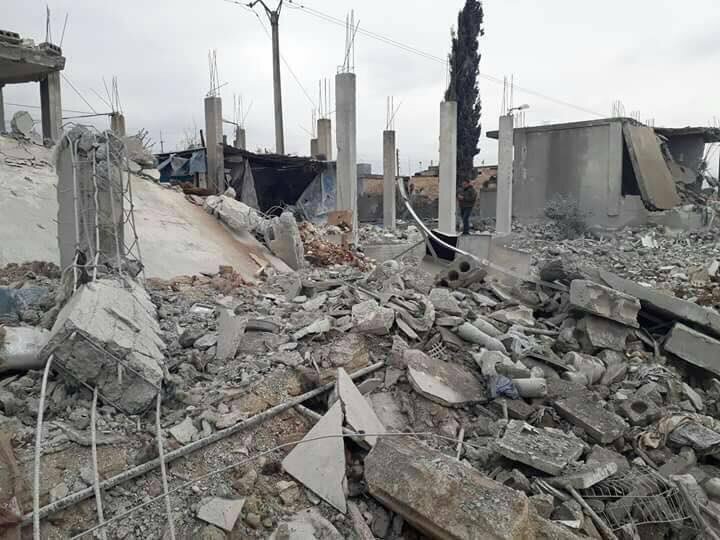 Casualty events tripled in October, a month marked by four devastating strikes on mosques which the Coalition itself admitted to targeting, claiming the buildings had been seized by ISIS. As strike numbers again rose in November, Airwars tracked the highest reported civilian harm since the fall of Raqqa in October 2017 with at least 221 civilians likely killed by the US-led alliance during the month. In December, marked by the battle for Hajin town itself, the Coalition carried out a massive 939 air and artillery strikes in Syria – a rise of 48% on November – and the highest number of declared strikes since September 2017. Likely civilian deaths fell by 59% on November, but remained at the third highest level seen for the year. 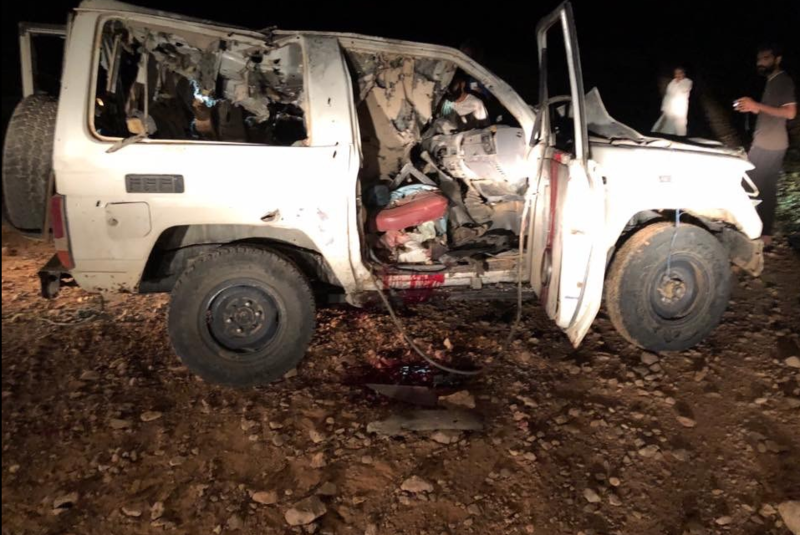 Across 15 events our current estimate is that between 91 and 161 civilians died in a number of large scale events centred around Al Soussa, Al Shaafa and Hajin itself. At least 32 children died in December alone during Coalition actions, according to credible local reports. In one of the worst events of the month, on December 5th, up to 25 civilians died in an alleged Coalition airstrike in Hajin. Victims reportedly included two members of ISIS and multiple children from their families. 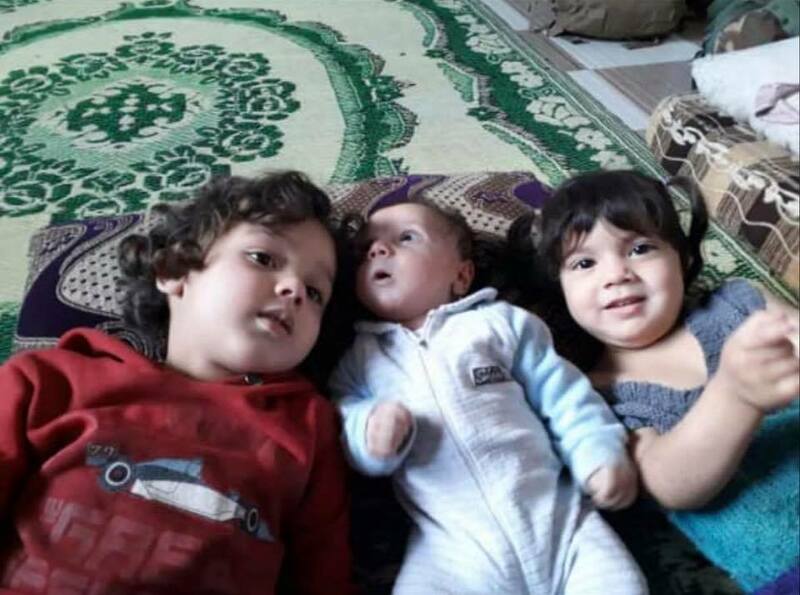 Children of Abdul Razzaq al-Jazzar, reportedly an ISIS member, who was killed with his wife and children by an alleged Coalition airstrike on the city of Hajin (via Palmyra). By December 14th, the SDF had captured Hajin from ISIS, depriving the terror group of its last major chunk of urban territory. Just as with previous assaults on Raqqa and Mosul in 2017, an urban assault of this ferocity frequently comes at lethal cost to those on the ground, placing civilians in an impossible position between ISIS fire and the Coalition’s formidable arsenal. The shock announcement by President Trump, on December 19th, that the US would withdraw its forces from Syria “as quickly as possible” led to confusion in the region. Up to an estimated 2,500 fighters remained in the Hajin area, it was claimed by Coalition spokesman Colonel Sean J. Ryan – and the terror group has repeatedly shown its potential for regrouping. There were some signs that Trump himself was acknowledging this, when at the end of the month he was said to be re-evaluating a rapid pullout, according to a Republican senator. Indeed, there was no slowdown in the tempo of strikes in the last weeks of 2018, clearly indicating that despite announcements to the contrary the war was far from over – and the risk to several thousand civilians still trapped in the so-called ‘Hajin Pocket’ remained. The year 2018 also saw Syrians under renewed threat elsewhere. On January 20th, Turkey began air and artillery strikes in the Kurdish-controlled enclave of Afrin, a district of Aleppo governorate which was also home to hundreds of thousands of displaced Syrians. By March 18th, Turkish-backed forces had captured Afrin city and its environs, though at significant cost to those on the ground with, according to Airwars estimates, between 220 and 347 civilians likely killed from Turkish strikes in Syria and a further 17 to 33 civilians killed in YPG counter strikes during the relatively short but fierce campaign. Turkish actions continued intermittently throughout the year – with both US and Russian forces acting as buffers against Turkish actions against the Kurdish held town of Manbij, for example. There were also a small number of Turkish strikes in Iraq during 2018, a reminder of Ankara’s continued military occupation of parts of northern Iraq. Between March 21st and December 13th, we tracked nine casualty events reportedly caused by Turkish forces in Iraqi territory, likely killing between 20 and 25 civilians. The first three months of the year proved to be exceptionally lethal for civilians trapped in Idlib and eastern Ghouta, as Russian and allied airstrikes rained down. Between January 1st and March 31st, Airwars tracked between 1,525 and 2,370 claimed deaths allegedly involving Russian warplanes in Syria, most of which were in Damascus and Idlib governorates. As the Eastern Ghouta offensive built momentum, civilians were left increasingly with nowhere to run or hide. By March, Airwars was tracking the worst recorded month in the Russian campaign so far. 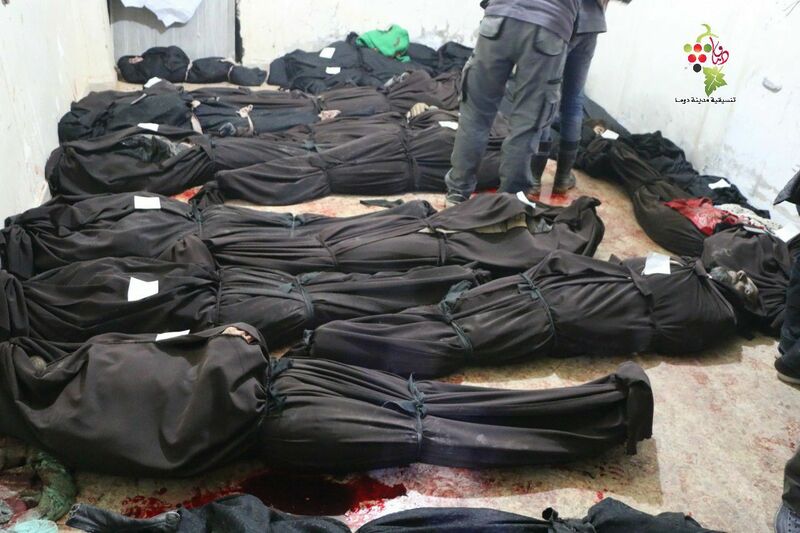 Across 250 alleged casualty events – a volume which exceeded even the 2016 siege of Aleppo – over 700 non-combatants were claimed killed in Eastern Ghouta. Entire families were reportedly wiped out, while others were said to have dug into the earth seeking shelter from the merciless assault. Following Assad’s complete capture of Damascus at the end of March, there was an 82% drop in Russian casualty events.. That volume remained low, with an average of 21 events per month from April to December. In a deal brokered in part by Russia, Turkey and Iran, the establishment of a demilitarised buffer zone in Idlib on September 17th was intended to separate government forces from rebel fighters. Surprisingly – and to the huge relief of civilians – this led to a fragile ceasefire, which continued to hold. Consequently, from mid-September 2018 and for the first time in three years, Airwars tracked no casualty events which were tied to Moscow. This shift in Russian actions continued until almost the end of 2018 – contrasting with the significant civilian harm still being caused by US-led Coalition actions in the final stages of its own anti-ISIS campaign in eastern Syria. Overall then in 2018, Airwars tracked a 27% fall in claimed Russian casualty events on the previous year, reflecting the variable tempo of Moscow’s campaign. There were 728 alleged events – the lowest number in any one year since the start of Putin’s campaign in autumn 2015. Even so, between 2,039 and 3,114 civilians were claimed killed across these 728 events – a 27% decrease from 2017 when between 2,727 to 4,065 civilians had allegedly been killed. This compares to between 1,015 and 2,015 civilians claimed killed in 182 alleged Coalition events during 2018. It should be noted that Moscow has yet to admit to a single death as a result of its own lengthy military intervention in Syria. In 2018, Libya witnessed a sharp decline in reported airstrikes compared to the previous year, down from 685 to 283 strikes according to Airwars/ New America Foundation monitoring. The minimum number of reported civilian fatalities also fell, from 52 to 35, marking the lowest levels seen since the beginning of the second Libyan civil war in 2014. This reflected a slight improvement in the overall political situation in the Maghrebian country. Even though Libya remained unstable in terms of security there were signs of detente, with two conferences held between the two major actors, the internationally recognised Government of National Accord (GNA) and the Libyan National Army (LNA). With the latter taking over Derna from the Al Qaeda-affiliated Derna Shura Mujahideen Council/Derna Protection Force in late June, jihadist forces no longer controlled any significant swathes of land in Libya. However, attacks by both ISIS and Al-Qaeda continue to shake the country as both remained active as insurgent groups. The LNA remained the most military active force in Libya, with 146 airstrikes recorded, reportedly leading to between four and twelve civilian fatalities. Besides Derna, hotspots of activity were in Libya’s south, and in the Oil Crescent which the LNA briefly lost to an alliance of the Petroleum Facility Guards and Benghazi Defence Brigades. Subsequently the LNA gained back control using air power. Interestingly, in terms of maximum recorded civilian deaths the US proved deadlier than the LNA in 2018 – a first. Given that the US only officially conducted seven airstrikes in Libya during the year this development was worrying, as AFRICOM strikes had reportedly been relatively precise in previous years. Despite a decrease in tracked airstrikes, Libyan skies remained lawless, to a significant degree. France, Egypt and the United Arab Emirates all reportedly conducted airstrikes in 2018. Additionally, there were also weaker reports of both Italian and Chadian airstrikes. The UAE in particular was very active, with 57 strikes reported, allegedly supporting the LNA’s effort to take over Derna. No civilian deaths were recorded from Emirati strikes but four people were reportedly injured. Egypt on the other hand reportedly killed three civilians on May 15th. Overall, Libya’s eastern neighbour reportedly conducted 17 strikes. In its attempts to control the shared border, 27 militants were reportedly killed and 61 vehicles destroyed in aerial actions, according to the Egyptian military. In addition, artillery was an important factor for civilian harm during 2018. Clashes between GNA-affiliated militias and the 7th Brigade (a non state actor) in Tripoli allegedly led to between 20 and 25 civilian fatalities. Since Airwars pioneered its military advocacy work following the start of the international campaign against ISIS in 2014, its engagement with Operation Inherent Resolve has grown year on year. The establishment of a permanent Coalition civilian casualty cell in December 2016 has been crucial to that engagement, with Airwars flagging more than 2,000 alleged civilian harm events to the US-led alliance to date. Over time, Airwars has become the dominant source for such claims. In 2018 Airwars referred just under 90% of all reported civilian harm events assessed overall by the Coalition. Of the 64 incidents adjudged Credible by the alliance during the year, 23 were Airwars referrals. Insufficient information on the location and time of an allegation continues to be the overriding reason for Non Credible assessments made by the Coalition. In the last year, a third of cases were dismissed on these grounds. For this reason, geolocation remains one of the team’s core activities. Airwars not only provided hundreds of enhanced geolocations to the Coalition relating to civilian harm during 2018, but has also published online a major archive of 600 geolocation notes detailing how coordinates were arrived at by the Airwars team via open source analysis. The year did see a significant improvement in the transparency of Coalition civilian casualty reporting, with the sharing by the alliance with Airwars of multiple Military Grid Reference System (MGRS) coordinates accurate to within 100m, for both Credible and Non Credible assessments. However, the Coalition continues to withhold the reasons for many of its determinations of civilian harm. For three quarters of all civilian deaths conceded by the alliance during 2018, it gave no further details on the cause. Airwars believes that one of the best tools available for mitigating harm to civilians is by improving knowledge of the circumstances in which it occurs. In this vein, the organisation contributed written evidence to the UK Parliament’s Defence Select Committee Inquiry into UK Military Operations in Mosul and Raqqa. Our strategic engagement with other external monitors and investigators also continued to bear fruit. 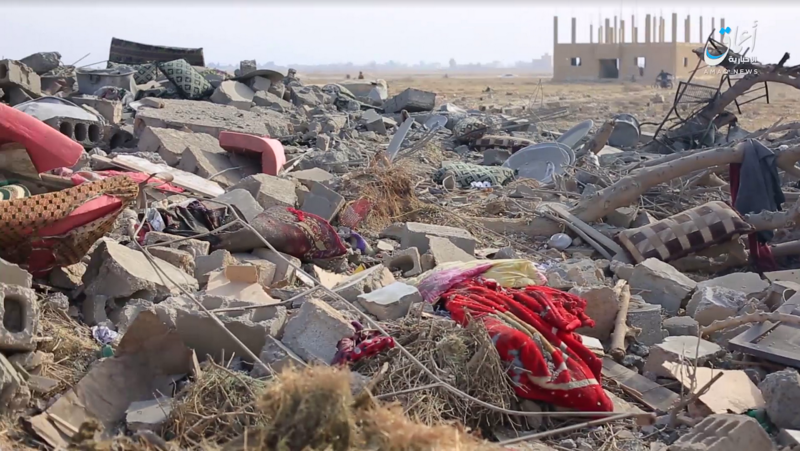 In March, a Mosul casualty case passed to Airwars by Amnesty International field researchers and subsequently flagged by our team to the Coalition, resulted in the third admission of civilian harm by Australia. That same month saw the UK’s Ministry of Defence concede its first civilian casualty in the war against ISIS, a single death in Syria’s Euphrates Valley – though the UK continues to deny any civilian harm from 1,000 targets struck by the RAF during the battles for Mosul and Raqqa. In the Netherlands, 2018 saw a slight improvement in military transparency. Following the renewal of its mission on January 5th 2018, the Ministry of Defense (MoD) released the locations of the nearest large settlement to Dutch strikes in its weekly updates. Previously no locational data was provided. However, for the first leg of the mission (2014-2016) little remains known about the locations and dates of Dutch military actions, with the MoD still refusing to publish these details. Therefore the Netherlands remains one the least transparent countries of the Coalition. While the MoD did admit responsibility for killing or injuring civilians in up to three Iraqi airstrikes, it continues to refuse to identify the dates and locations of these events. On April 13th 2018, findings of a Public Prosecution Service assessment of four potential civilian harm incidents were presented to Parliament by the Minister of Defense. As noted in an Airwars article, when our advocacy officer asked the MoD why such basic but vital information as the dates and locations of these events was not shared publicly, a spokesperson responded that on national and operational security grounds nothing further would be divulged. The political landscape changed slightly throughout the year, following national elections in October 2017. While opposition parties the SP, PvdA and Groenlinks have continued to raise concerns about the lack of transparency on civilian casualties of Dutch airstrikes, the D66 party changed its stance significantly after joining the ruling coalition. In a plenary debate held in December 2018 on Dutch participation in the fight against ISIS, D66 MP Sjoerd Sjoerdsma even asserted that the Netherlands was the most transparent member of the Coalition, despite having previously raised concerns about its lack of transparency. During this debate, two motions were filed by opposition parties. The first called for an independent investigation into civilian casualties resulting from Coalition airstrikes. The second motion called for the publishing of information on incidents involving civilian casualties from Dutch airstrikes. While the first motion was denied, the second was tabled, and will be brought to a vote in 2019. 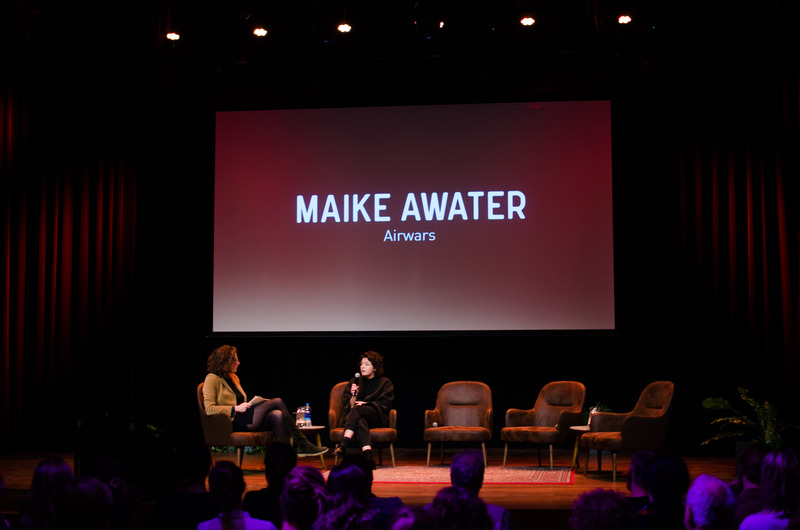 Airwars advocacy officer Maike Awater discusses the challenges of Dutch military transparency and accountability.